The NDP has asked the RCMP to launch an investigation into the $90,000 payment from the prime minister's former top aide, Nigel Wright, to Senator Mike Duffy in relation to the Senate expense scandal. The NDP is calling on the RCMP to investigate the actions of Prime Minister Stephen Harper's former chief of staff, Nigel Wright, who resigned recently after news emerged of a secret $90,000 payment he made to Senator Mike Duffy in relation to the Senate expense scandal. NDP ethics critic Charlie Angus announced Monday that a letter had been sent to the commissioner of the RCMP, Robert Paulson, requesting an investigation into what he calls "a fundamental breach of the public trust." The action escalates previous NDP demands for an independent inquiry. "I am concerned that such acts may violate the laws that the RCMP is charged with upholding and enforcing," said Angus in his letter. "I request that the RCMP take these concerns into account, investigate promptly and take all appropriate action." Duffy announced last month that he had repaid, on March 25, about $90,000 claimed over the last three years for his Senate housing and living expenses. He is one of three senators at the centre of an external audit over expense claims. The former journalist resigned from the Conservative caucus last Thursday, a week after audit and Senate committee reports were released on his expenses, as well as those of senators Patrick Brazeau and Mac Harb. At a Ottawa news conference Monday, Angus urged the prime minister to "come clean" about when he knew about the secret payment between Wright – who resigned his position Sunday – and Duffy. 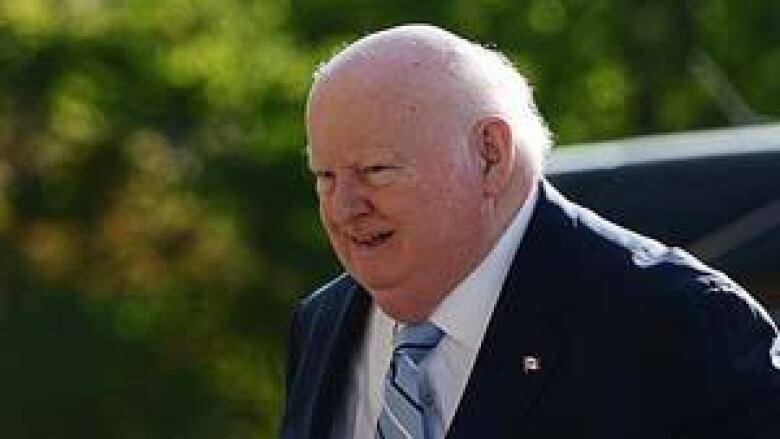 "I did not advise the prime minister of the means by which Senator Duffy's expenses were repaid, either before or after the fact," Wright said in his resignation statement. He had been Harper's chief of staff since January 2011. "Stephen Harper is famous for his control over his government and MPs," said Angus. "And we're expected to believe that [he was unaware that] his chief of staff was negotiating a secret deal to pay off Mr. Duffy?" Angus referred to an email in which Duffy said, "I stayed silent on the orders of the PMO" concerning the external audit. Angus said he also wants to know if senators were told to "go easy" on Duffy in their own report about the living expenses claims. "The Senate has shown absolutely no leadership on this...they have been pitiful in their response," noted Angus. "It seems that they're more interested in protecting their own. So I ask the Senate: 'Where are you guys?'" Angus also posed the question about why other senators caught up in the expenses controversy seem to have been "thrown overboard." "We know this kind of payment wasn’t offered to Patrick Brazeau." Senator Brazeau — expelled from the Conservative caucus after he was charged in February with assault and sexual assault — has been told he should repay $48,744 in expenses by a Senate committee. Angus also pointed out that Senator Pamela Wallin, appointed by Harper, appears to have been left out in the cold in the wake of the continuing investigation into her expense claims. On May 17, Wallin released a statement saying she has recused herself from the Conservative caucus, adding that she is co-operating "fully and willingly" with auditors. "Something was offered to Mike Duffy, we don't know yet," said Angus. "The question that has to be answered is: What was the $90,000 payment for and were there other senators involved? ... Whether or not they changed the findings [of their report on Duffy] to go easy on one of their political pals is a major major breach of public trust." Angus says the prime minister needs to reveal his role in the secret money exchange between his ex-chief of staff and Duffy. "Canadians deserve the truth – something they have not gotten yet from the prime minister or the Conservatives."